meant to instill male dominance in Christianity. role model for sinners especially harlots. about historical references to Mary Magdalene. 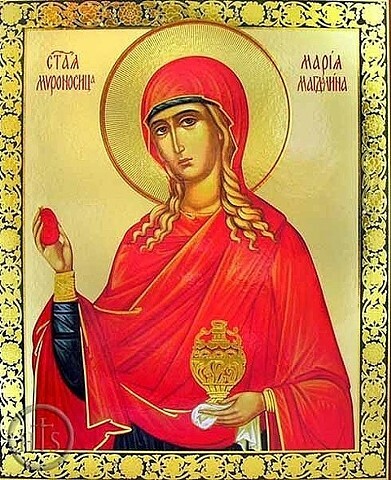 Mary Magdalene is one of my favorite Saints for pretty ridiculous reasons being that she is the patron saint of hair dressers and I am totally enthralled that she is the only Saint holding a red egg repeatedly in her portraits. To me — Mary Magdalene — falls in the “what’s not to love” category but I am aware that some people think she has a bad reputation. ways to describe and identify Mary Magdalene. 1. Apostle to the Apostles — Mary Magdalene was first to inform the other apostles that Jesus had risen. 2. The Faithful Follower — there is little denial that Mary Magdalene was the biggest believer in Jesus. She helped financially support His ministry at a time when women typically had no money. And just was such a faithful follower there is speculation about the grounds of Mary Magdalene’s faithfulness because other apostles were very jealous of her relationship with Jesus. 3. Divine Feminine — because of the fact that Mary Magdalene was an apostle and follower of Jesus; she serves as an acceptable reference for women to see how God is also a woman. (Ie. Humans were created in God’s image and likeness) Especially when women do not remain virgins their entire life like the Blessed Virgin Mary— Mary Magdalene plays an important role in relating to all women no matter what their mental state is or how much money they have or sexuality and lifestyle. This is probably the most important aspect about Mary Magdalene.